Hearthside Chariot Mobile Wood Fired Pizza | Mobile Wood Fired Oven where the "Chariot" brings Hot - Fresh Gourmet Style Pizza and Edibles to you. Where the “Chariot” brings Hot-Fresh Gourmet-Style Pizza to you. Real Fire. Real Ingredients, Real Good! 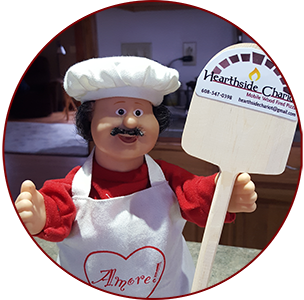 Hearthside Chariot LLC is a mobile, 900 degree wood fired oven on a trailer. Our signature dough is hand made along with our pizza sauces. The cheese is a blend of Italian varieties. The toppings are the freshest available. The Chariot and crew will come to any event, party, festival or back yard party so you can spend more time with your guests. We have also set up (and this can be fun) a make and bake party for your guests. We bring all the supplies, the oven, and some fun to your home. Experience Pizzeria Pizza without all the work while making your favorite pizza. Give us a try, you’ll be glad you did. 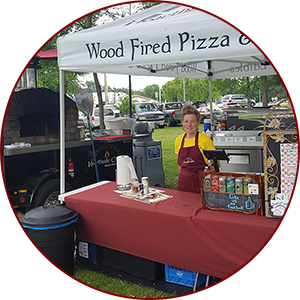 For a taste of our wood fired pizza, visit one of our events. See our Events Page for our booked location dates and times. Follow Facebook to keep track of where the “Chariot” will be. We look forward to serving you. We can “Fire-Up” any event! Private events are served to you Buffet style! Our pizzas are prepared on site with our signature hand tossed dough. Pizzas are baked in a 900 degree wood fired oven to create a culinary delight uniquely different from conventional ovens. Using the highest quality ingredients, each pizza is hand crafted into either classic, or gourmet styles. Pizza of your choosing. 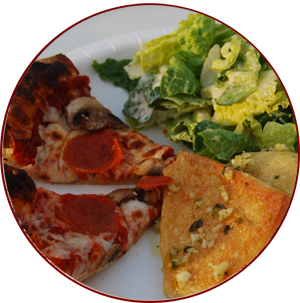 We don’t just serve pizza, a variety of other edibles are available upon request. WRM Porkfest : PIzza, Pig roast dinner, Pork sandwiches, Brats. Farmers Market & Craft Show. Music. Come on out to the park for some Pizza to start the evening. Then at 8pm The Presidents Band will be playing. Come Out to enjoy the day. Pizza starting at 11 am. I have been all over this state looking for what I just found. Having managed an Italian restaurant, I would put my word on the line and say that this is honestly the best Pizza I have had in Wisconsin. Incredible. Owners are gracious and humble. I enjoyed my experience so much that I would buy a ticket to a festival I didn’t even want to go to, walk in, buy this Pizza and walk out. Truly real deal. Bottom line… EAT THIS PIZZA. Amazing pizza! You can tell they use high quality and fresh ingredients. The crust is perfect too. Best pizza I have ever tasted! You must check them out! Tried the pizza at Wa Da Shuda Days and it was to die for! I absolutely recommend this to everyone! The tailgater pizza is phenomenal! Had my first Hearthside Chariot pizza experience this weekend and it was amazing! !Hats off to Joey and Karen for knocking pizza out of the park! Best crust and sauce around. Can’t wait for the next one! ©2018 Hearthside Chariot | All Rights Reserved.